One factor holding back a stronger rebound in home construction has been the tight availability of acquisition, development and construction (AD&C) loans. However, recent data confirm that net lending is on the rise. According to data from the FDIC and NAHB analysis, the outstanding stock of 1-4 unit residential AD&C loans made by FDIC-insured institutions rose by $1.952 billion during the first quarter of 2014, a quarterly increase of 4.46%. The first quarter expansion of the stock of AD&C loans marked the fourth consecutive quarter of increase. Since the end of the first quarter 2013, the stock of outstanding home building AD&C loans is up 12.2%, an increase of just under $5 billion. It is worth noting the FDIC data report only the stock of loans, not changes in the underlying flows, so it is an imperfect data source. Nonetheless, the consistent growth in the outstanding stock of AD&C loans is a positive development. 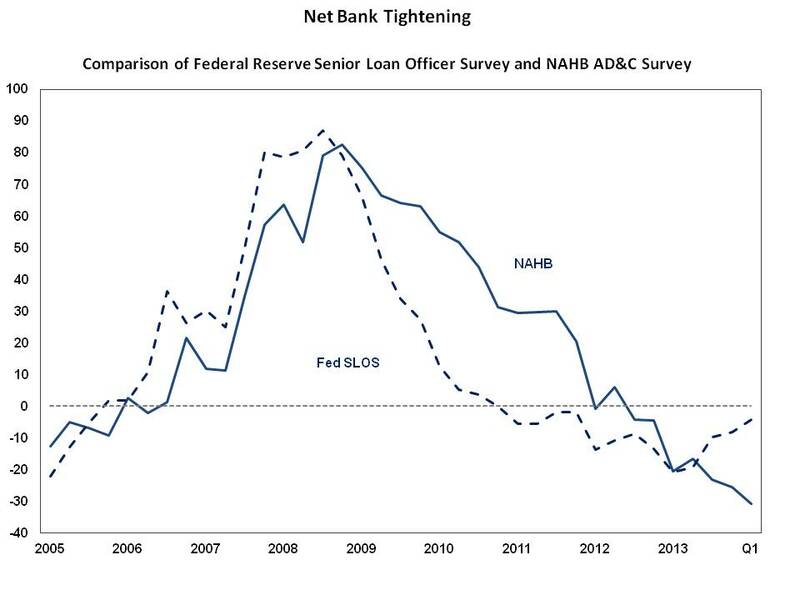 NAHB surveys of builders also suggest improving lending conditions. However, lending remains much reduced from years past. The current stock of existing residential AD&C loans (the blue area on the graph below) of $45.7 billion now stands 77.6% lower (denoted by the red line) than the peak level of AD&C lending of $203.8 billion reached during the first quarter of 2008. The FDIC data reveal that the total decline from peak lending for home building AD&C loans continues to exceed that of other AD&C loans (nonresidential, land development, and multifamily). Such forms of AD&C lending are off a smaller 61.6% from peak lending. This class of AD&C loans has now registered three quarters of significant increases (1.5% for the first quarter of 2014). Some land development loans connected to home building are grouped in this other class. NAHB survey data indicate land development loans face tighter lending conditions than loans for residential construction purposes. Despite the recent uptick in residential AD&C lending, there exists a lending gap between home building demand and available credit. This lending gap is being made up with other sources of capital, including equity, investments from non-FDIC insured institutions and lending from other private sources, which may in some cases offer less favorable terms for home builders than traditional AD&C loans. Builders and developers continue to report easing credit conditions for acquisition, development, and construction (AD&C) loans according to NAHB’s survey on AD&C financing. In the first quarter of 2014, the overall net tightening index based on the AD&C survey improved (i.e., declined) from -25.5 to -30.8. The index is constructed so negative numbers indicate easing of credit; positive tightening, so a lower negative index means greater easing. 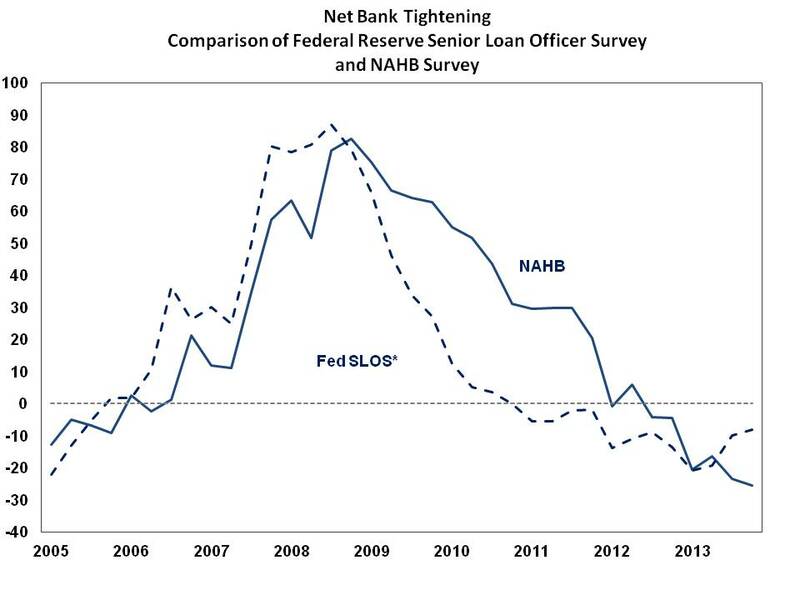 Meanwhile, a similar net tightening index from the Federal Reserve’s survey of senior loan officers edged up from -8.1 to -4.2. This is the third consecutive quarter that the two indices moved in opposite directions. According to the NAHB survey, less than 15% of respondents report credit conditions worsening in the first quarter. For example, only 6% of NAHB members said availability of credit for land acquisition had gotten worse, compared to 33% who said it had improved. Only 5% reported worsening credit conditions for single-family construction, compared to 46% who reported better conditions. Similarly, only 5% and 13%, respectively, said credit available for land development and multifamily construction was worse during the first quarter of 2014. Among members who reported tighter credit conditions in the first quarter, the most common problems were requiring personal guarantees or collateral not related to the project (60%), reducing the amount they are willing to lend (55%), lenders simply not making new loans and lowering the allowable LTV (or loan-to cost) ratio (50% each). Although commercial banks remain the primary source of credit for AD&C by a wide margin, private individual investors have emerged as a viable alternative, especially for A&D loans. Private investors were the primary source of land acquisition loans for 25% of NAHB members, of land development loans for 11%, and for single-family construction loans for 9%. For A&D loans, private individual investors were the second most common source of credit (they were third most common for single-family construction after thrift institutions). The second most common source of multifamily construction loans was housing finance agency programs (17%). The percentages of builders and developers putting projects on hold until the financing climate improves were slightly higher than in the fourth quarter 2013. For land acquisition, the share putting projects on hold increased from 27% to 32%; for land development, the share increased from 27% to 31%; and for single-family construction, it went up from 17% to 20%. For multifamily construction, the share putting projects on hold increased from 13% in the fourth quarter of 2013 to 23% in the first quarter of 2014. Data from the FDIC indicate that smaller financial institutions, typically community banks, are the most common sources of lending for home building acquisition, development and construction (AD&C) loans. This trend strengthened during years of the housing crisis. The FDIC data are split into two sources: commercial banks and savings institutions. As of the final quarter of 2013, total 1-4 residential construction and development loans held by commercial banks summed to $38.9 billion. Such loans from savings institutions represented a smaller source: $4.8 billion. With respect to commercial banks, the fourth quarter 2013 FDIC data reveal that 62% of home building AD&C lending was held by banks roughly matching the community bank standard of possessing less than $10 billion in total assets. This lending was decentralized as there are almost 5800 such institutions, although it is not possible to determine how many held residential AD&C loans. In contrast, there were 90 commercial banks with more than $10 billion in assets, holding a still significant $14.7 billion in home building AD&C loans. 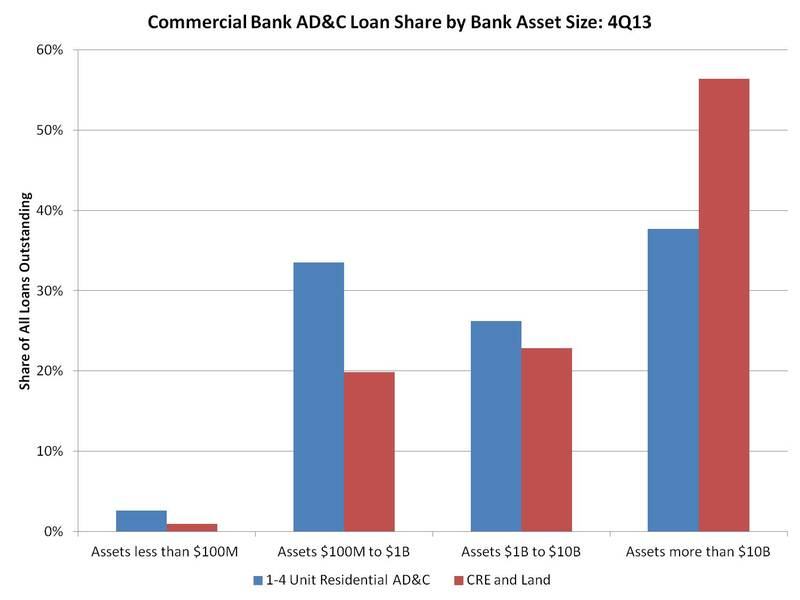 Nonresidential AD&C lending, which includes some land development financing and commercial real estate, is more likely to be held by larger banks, as the chart above indicates. In fact, more than half (56%) of such loans were held by commercial banks with more than $10 billion in assets. A larger share of residential AD&C was held by larger institutions prior to the recession. 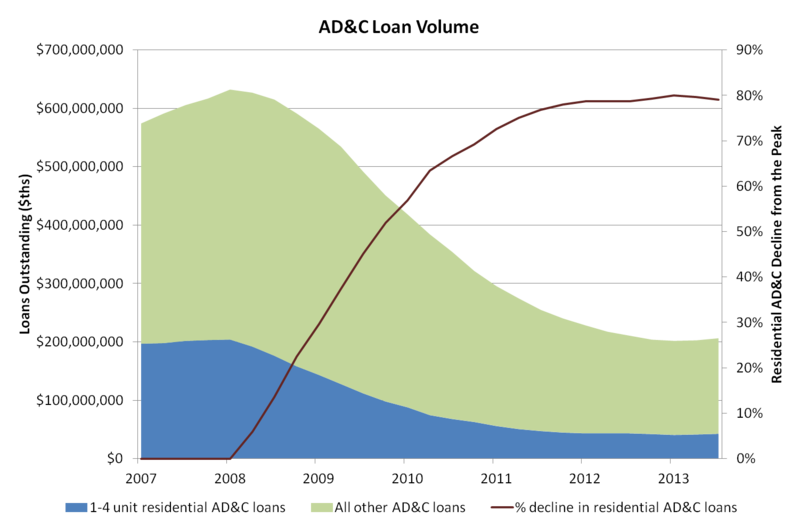 The chart above notes the change in market share from the end of 2007 to the end of 2013. 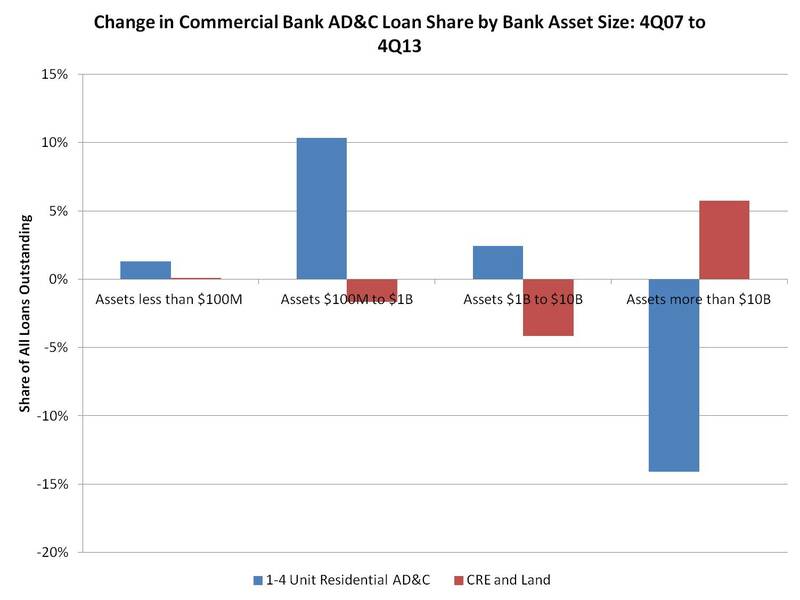 While the share of nonresidential AD&C held by large banks increased over this six-year period, the market share of residential AD&C shifted to smaller banks. For example, at the end of 2007, 52% of home building AD&C was held by banks with more than $10 billion in assets, a swing of 14 percentage points of market share from 2007 to 2013. The smaller savings institutions side of the market tells a similar story. 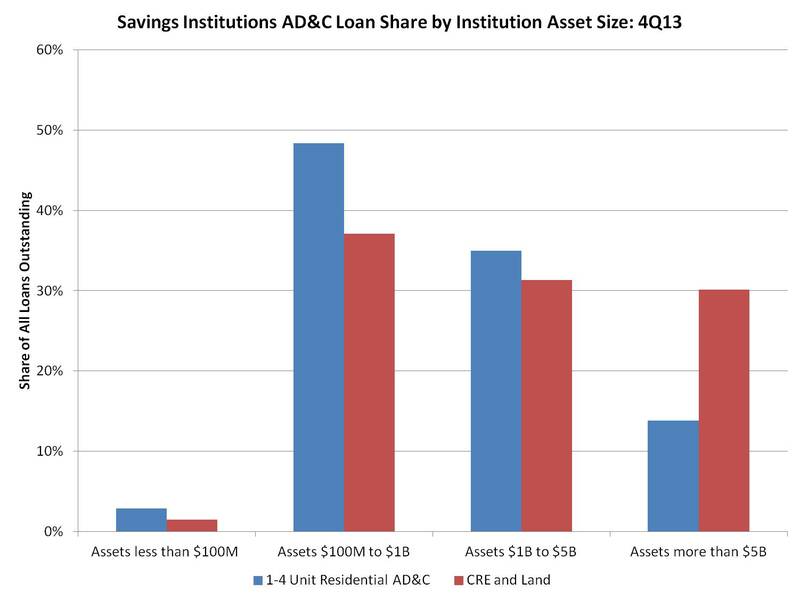 At the end of 2013, 86% of home building AD&C loans held by savings institutions was controlled by institutions with less than $5 billion in assets. 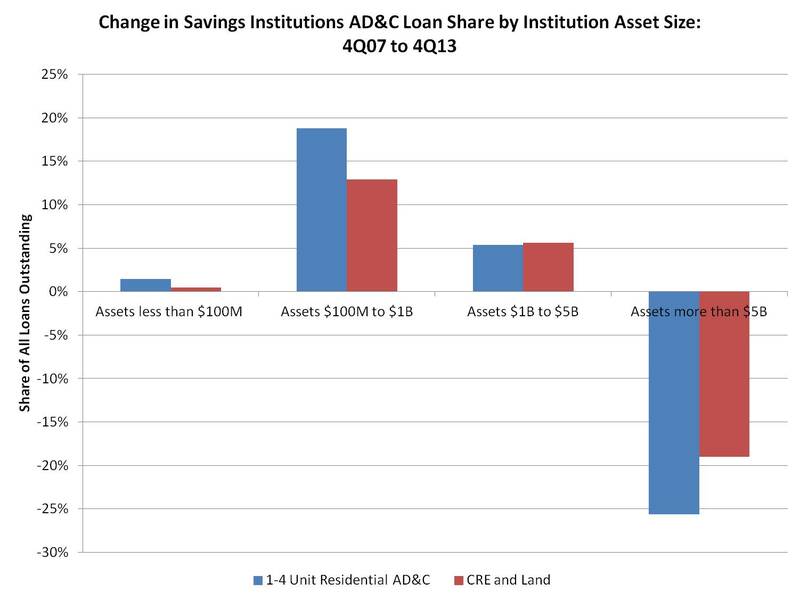 A noticeable difference is that both residential and nonresidential AD&C lending shifted, in terms of market share, toward smaller savings institutions from the end of 2007 to the end of 2013, as the following chart demonstrates. One factor holding back an even stronger rebound in home construction has been the tight availability of acquisition, development and construction (AD&C) loans. However, it appears the period of dramatic declines in the outstanding stock of AD&C loans ended in 2012, and recent data confirm that net lending is on the rise. According to data from the FDIC, the outstanding stock of residential AD&C loans made by FDIC-insured institutions rose by $1.151 billion during the final quarter of 2013, a quarterly increase of 2.7%. Since the end of the first quarter, the net stock of outstanding AD&C loans is up 7.4%, an increase of more than $3 billion. It is worth noting the FDIC data report only the stock of loans, not changes in the underlying flows, so it is an imperfect data source. Nonetheless, the stabilization of the stock value over the last year and a half plus three quarters of increases indicate overall improving conditions for AD&C lending. NAHB surveys of builders also suggest improving conditions. However, lending remains much reduced from years past. The current stock of existing residential AD&C loans (the blue area on the graph below) of $43.7 billion now stands 78.6% lower (denoted by the red line) than the peak level of AD&C lending of $203.8 billion reached during the first quarter of 2008. The FDIC data reveal that the total decline from peak lending for home building AD&C loans continues to exceed that of other AD&C loans (nonresidential, land development, and multifamily). 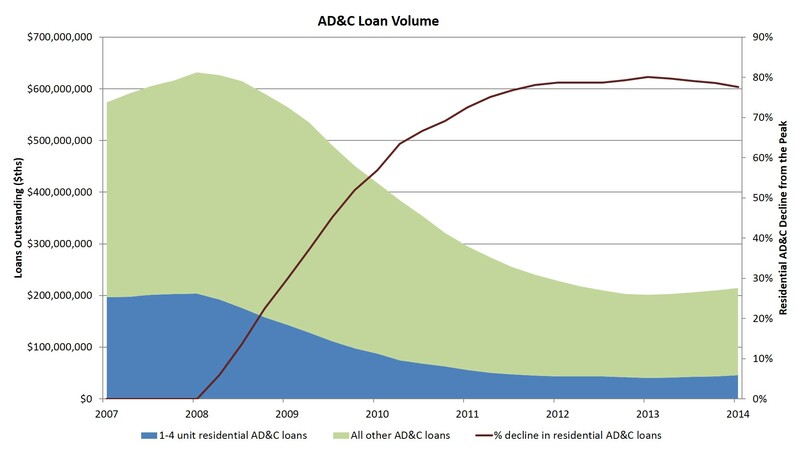 Such forms of AD&C lending are off a smaller 62% from peak lending. This class of AD&C loans has now registered two quarters of significant increase (1.7% for the fourth quarter of 2013). Despite the recent stabilization in residential AD&C lending, there exists a lending gap between home building demand and available credit. Since the beginning of 2007, the dollar value of the pace of single-family permitted construction is down 39%. During this same period, home building lending for AD&C purposes is down 78%. This lending gap is being made up with other sources of capital, including equity, investments from non-FDIC insured institutions and lending from other private sources, which may in some cases offer less favorable terms for home builders than traditional AD&C loans. Builders and developers continue to report easing credit conditions for acquisition, development, and construction (AD&C) loans according to NAHB’s fourth quarter 2013 survey on AD&C financing. At the end of 2013, the overall net tightening index based on the AD&C survey improved (i.e., declined) from -23.3 to -25.5. The index is constructed so negative numbers indicate easing of credit; positive tightening, so a lower negative index means greater easing. Meanwhile, a similar net tightening index from the Federal Reserve’s survey of senior loan officers edged up slightly from -9.9 to -8.1. This is the second consecutive quarter that the two indices move in opposite directions. According to the survey, availability of all categories of residential AD&C loans improved in the fourth quarter. For example, only 5% of NAHB members said availability of credit for land acquisition had gotten worse, compared to 35% who said it had gotten better. Only 5% reported worsening credit conditions for single-family construction, compared to 40% who reported better conditions. Similarly for land development and multifamily construction fewer than 10% said credit availability was worse during the fourth quarter of 2013. Among the relatively few members who reported tighter credit conditions in the fourth quarter, the most common problems were lenders simply not making new AD&C loans (60%), reducing the amount they are willing to lend and lowering the allowable LTV (or loan-to cost) ratio (56% each), and requiring personal guarantees or collateral not related to the project (52%). Although commercial banks remain the primary source of credit for AD&C by a wide margin, private individual investors have emerged as a viable alternative, especially for A&D loans. Private investors were the primary source of land acquisition loans for 22% of NAHB members, of land development loans for 16%, and for single-family construction loans for 9%. In each case, private individual investors were the second most common source of credit. The second most common source of multifamily construction loans was a two-way tie (at 7% each) among housing finance agencies and private individual investors. According to data from the FDIC, the outstanding stock of residential AD&C loans made by FDIC-insured institutions rose by $1.126 billion during the third quarter of 2013, a quarterly increase of 2.7%. Since the end of the first quarter, the net stock of outstanding AD&C loans is up 4.8%, an increase of just under $2 billion. It is worth noting the FDIC data report only the stock of loans, not changes in the underlying flows, so it is an imperfect data source. Nonetheless, the stabilization of the stock value over the last year and a half plus two quarters of increases indicate overall improving conditions for AD&C lending. NAHB surveys of builders also suggest improving conditions. However, lending remains much reduced from years past. The current stock of existing residential AD&C loans (the blue area on the graph below) of $42.7 billion now stands 79% lower (denoted by the red line) than the peak level of AD&C lending of $203.8 billion reached during the first quarter of 2008. The FDIC data reveal that the total decline from peak lending for home building AD&C loans continues to exceed that of other AD&C loans (nonresidential, land development, and multifamily). 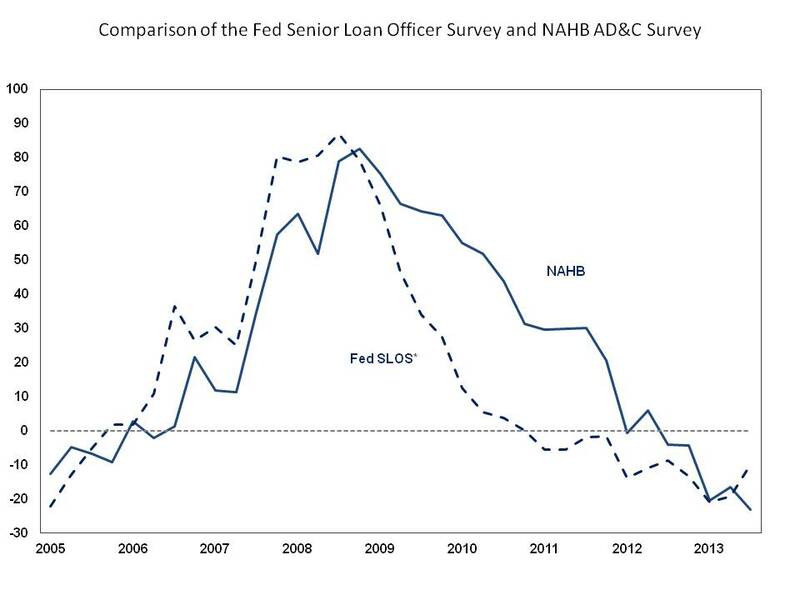 Such forms of AD&C lending are off a smaller 63% from peak lending. For the third quarter, this class of AD&C loans registered its first significant increase (1.6%). Despite the recent stabilization in residential AD&C lending, there exists a lending gap between home building demand and available credit. Since the beginning of 2007, the dollar value of the pace of single-family permitted construction is down 43%. During this same period, home building lending for AD&C purposes is down 78%. Builders and developers continue to report credit easing for acquisition, development, and construction (AD&C) loans according to NAHB’s survey on AD&C financing. In the third quarter of 2013, the overall net tightening index based on the AD&C survey was -23.3. The index is constructed so negative numbers indicate easing of credit. A similar net tightening index for commercial real estate lending from the Federal Reserve’s survey of senior loan officers was -9.9 in the third quarter 2013 for construction and land development loans. According to the NAHB survey, the availability of credit for land acquisition continues to improve. Only 9% of NAHB members said availability of credit for land acquisition had gotten worse in the third quarter, compared to 28% who said it had gotten better. Only 5% reported worsening credit conditions for single-family construction, compared to 38% who said it got better. For land development and multifamily construction, at least twice more members said availability was better than said it was worse. Another sign that conditions continue to improve is the fact that 61% of members report seeking loans for single-family construction in the third quarter, the highest share since July 2008. 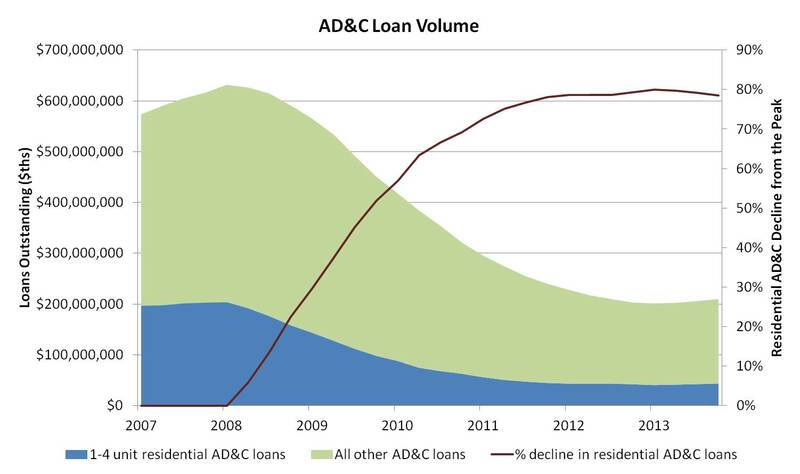 Among members who said AD&C credit conditions had continued to deteriorate in the third quarter, the most common problems were lenders reducing the amount they are willing to lend (69%), lowering the allowable LTV (or loan-to cost) ratio (62%), simply not making new AD&C loans, and requiring personal guarantees or collateral not related to the project both cited by 54%.